An ancient New Guinea myth says the human race originated from the first man making love to a stalk of sugar cane. But in modern times, our love affair with sugar has created a health crisis. The average American consumes nearly 23 teaspoons of sugar a day, three to four times the American Heart Association’s recommended daily limit. Obesity, diabetes, high blood pressure and heart disease have all been linked to excessive consumption. Diane and her guests discuss the history of sugar, why we crave it, how our bodies evolved to process it and why it could be making us sick. Richard Cohen Author of "Sugar Love (A Not So Sweet Story)” in the August 2013 edition of National Geographic magazine, contributing editor at Vanity Fair and Rolling Stone, and author of seven books, including the memoir “Sweet and Low” and "The Monsters," which will be released in October 2013. All images from the August 2013 issue of National Geographic magazine © Robert Clark/National Geographic. See more photos of sugar in its many forms. MS. DIANE REHMThanks for joining us. I'm Diane Rehm. The average American eats 27 pounds of sugar a year. Increased consumption of fructose has been associated with rising rates of obesity, diabetes, high blood pressure and heart disease. This month's National Geographic magazine explores the role of sugar in world history, why we crave it and what it's doing to our health. The title is "Sugar Love: A Not-So Sweet Story." MS. DIANE REHMAuthor Richard Cohen joins me in the studio. With us from Aspen is Dr. Richard Johnson, he's professor of medicine at the University of Colorado Denver. MS. DIANE REHMYou're welcome to be part of the program. Join us by phone at 800-433-8850. Send us an email to drshow@wamu.org. Follow us on Facebook or send us a tweet. Good morning to both of you. REHMGood to have you both with us. And Rich Cohen, your family has quite a history with sugar, talk about that. COHENWell, I think that my family's sort of connected to the history of sugar. My grandfather Ben Eisenstadt owned a diner in the Brooklyn Navy Yard which swelled with business during the Second World War and then all the customers stopped coming, no more guys in the Navy base after the war. COHENAnd he had no business and didn't know what to do and he first tried to bag tea. He bought an old tea-bagging machine, bagged tea. Nobody was interested in his tea, had no money, had a bunch kids, was living in Brooklyn and he didn't know what to do with his tea-bag machine. COHENAnd my grandma, Betty, came up with the idea of why not package sugar because he had these tea-bags. REHMIn these little, tiny packets. COHENYeah, he invented the sugar packet in his diner. The reason is they would have to go through the diner and clean off the sugar dispensers at the end of every day and he thought it was disgusting and unhygienic. He started packaging sugar. He invented the sugar packet and he went down the road to Domino Sugar and he showed them his invention and they said two questions. How does it work and did you get a patent? COHENAnd he hadn't gotten a patent. So Domino made their own machines and then he started packaging for smaller sugar companies. And he always wanted his own product and he was always on a diet so he's part of this story of too much sugar. COHEN...and he found out people were stealing it from hospitals. When my father started dating my mother, this just gives you a sense of the pathos of the story, he would show up for a date and there would be like 15 cups of coffee and have to try each one, my father, to say which one tasted better. COHENIn the '70s, when scientists said that the main ingredient, saccharine, caused cancer, my father's first reaction was ,I knew it. I knew he was trying to poison me way back when. REHMNo. Well, now, turning to you, Dr. Johnson, what is the earliest recorded evidence of a link between sugar and health? JOHNSONOh, well, I think the earliest reports linking sugar with obesity and diabetes goes back to ancient India and the Ganges River Valley where Sushruta, a physician, would write about the relationship between sugar intake and the development of obesity and diabetes. REHMWhat about this so-called craving, Rich? What is it that happens in the body to have us have a tiny bit of something sweet and then want something more? COHENWell, I think it has to do with our evolution, our deep evolution. And probably Dr. Johnson should answer this because he knows as well as anyone in the world and he could tell you what actually is going on with your body. JOHNSONWell, yes. So I mean, babies will prefer sugar water over milk and so it's a very innate response. And studies have shown that the ingestion of sugars, which you know basically consist of glucose and fructose, that this stimulates dopamine in the brain, which is a pleasure response. JOHNSONAnd so there's a general liking. 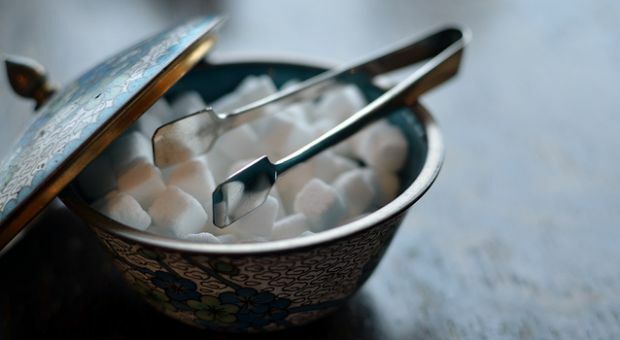 Most people will like sugar just in an innate way. When you give mice sugar water or glucose water or anything that's very sweet, they'll tend to really, really love it and if you give it intermittently, they'll wait there very expectantly and they'll just wait for the water, the sugar water to be given to them and they'll drink it really, really fast. JOHNSONAnd because of this desire and over time these mice will actually become addicted to it, where if you actually withdraw the sugar water, they'll actually show signs of withdrawal. And what we think is happening is that repeated stimulation of this dopamine response in the brain leads to a down regulation of the receptor so they have to drink more to get the same pleasure response. JOHNSONAnd so this is what kind of sets up kind of an addicting response. Now not everybody, of course, is addicted to sugar and some people crave it more than others. And there's even some studies suggesting that genetic polymorphism is controlling the dopamine receptors and the brain may actually help predict who becomes addicted and not, to, for example, like cocaine and other things and it may well carry over to sugar. REHMYou know, it's interesting. I can drink a single coke and I get an immediate high and then I plunge so I don't drink Coca-Cola anymore. I don't drink any soft drink for that very reason that somehow it must go right to my brain, give me that high and then I'll fall asleep. And I mean, what's going on there? JOHNSONYes, well, what happens is, you know, that's a very common sign or symptom that people talk about. It's harder to prove exactly what's happening, but we do know this. That sugar contains fructose just like high fructose corn syrup and these are the two main sweeteners that are out there. And the fructose is metabolized very differently from all other foods. It's the only food that, it goes under a very rapid burning of basically it's metabolized very, very quickly. JOHNSONAnd then there's this period of ATP depletion or energy depletion and the cell actually becomes depleted of energy. And you can show this in cells and culture or even in animals and even in humans. So--but whether or not this is what corresponds to your feeling of becoming high and then suddenly crashing, you know, it's quite possible that this is related, but there definitely is this burning of this fructose. JOHNSONIt's very rapid and then there's this depletion of energy that occurs inside the cell. And we think that that is actually key for how the fructose works to stimulate fat and it's basically the professional fat-storing nutrient of our diet. REHMRich, talk about the addiction, if you will, that some individuals and perhaps even those in the lower socio-economic class begin to have for sugar and sugar-like products. COHENWell, when you're a kid, and I have little kids myself now so I see it, you basically eat what's given to you, you know. So a lot of the food that you'll find in convenience stores, as opposed to supermarkets, and even a lot of the foods that are marketed as healthy are marketed as having no fat. COHENI've noticed that even like Chuckles, they say, no fat, you know, so that you can live on Chuckles and you'll be just fine, I guess. And the fact is a lot of this stuff like yogurt with fruit, they have a tremendous amount of added sugar. That's what makes up for whatever is taken out to make it so-called healthy. COHENAnd if you have kids, you can see the immediate result. And if you're a parent who has basically had a good diet and suddenly has kids and you're suddenly swamped in these kinds of foods you've avoided for 15 or 20 years. you see that it is like a drug because when you're very tired, you sort of live on the stuff like you live on a stimulant and you sort of go up and down with it. COHENSo I think that there's just a tremendous amount of sugar and it becomes very hard to stop eating it. One, because when you stop, you don't feel very good and two because it's in things you don't even realize it's in. So when you're trying to, let's say, live healthy by eating yogurt in the morning, you're, in fact, eating a lot of added sugar. REHMWell, but suppose you're eating yogurt that's plain without any fruit attached to it? COHEN...the hardest thing in the world, but it actually takes a little bit of effort. COHENWill power and also reading of labels and planning meals and all that kind of stuff. And sometimes, you know, people are in a big hurry and they just grab what's available and they're not even really aware. I always say, people say, you are what you eat, but we don't even know what that is. REHMTell me how much research you did for the article in National Geographic. COHENWell, I did a lot of research. And to me, I mean, we have Dr. Johnson here so to me, he's like the expert of experts on this. That's why when it comes to the science, I sort of defer to him obviously. But to me, I was interested in the sort of big arc of sugar at a time when it was, you know, from its ancient history 10,000 years ago in New Guinea to the history of sugar processing and how sugar slowly moved through millennia, from, you know, Asia through eventually into our world where it's everywhere. REHMRich Cohen, he's the author of "Sugar Love: A Not-So Sweet Story." It appears in the August edition of National Geographic magazine. Short break here. When we come back, we'll talk more and take your calls. REHMAnd if you've just joined us, Rich Cohen is with me. He's the author -- pardon me -- of an article in the August National Geographic all about sugar and what it does to our bodies, the history of sugar and, you said, going all the way back to its introduction in New Guinea. How did it get linked with slavery? COHENWell, basically it went from New Guinea into India, into Asia, into Persia which was then -- and then when there was the Arab conquest of Persia, the Arabs took it with them and linked it up based with Europe. And the first Europeans who really knew about refined sugar were crusaders during the crusader wars. And it's interesting to me because I was very interested in school in the age of exploration, which we're taught was all about curiosity. You know, John Kennedy, the new frontier and connecting to this old idea of people's curiosity. COHENWhen you really look at it, as much as anything it was a sugar boom, the age of exploration. And it was a search by Europeans for islands where they could grow their own sugar. To grow sugar cane you need basically the tropics. You needed a long growing season, you needed an unbelievable amount of rain. And they started looking for islands to plant the stuff. And when they went to places like Barbados and other places where native people died trying to work the plantations, Europeans died and they started bringing in African slaves to work on these sugar plantations. COHENAnd even in the Arab world, the people that worked on the sugar plantations were slaves, often taken -- Eastern Europeans taken in as prisoners of war. And one legend is that the word slaves comes from the word Slavs so -- because those were the slaves. So a really interesting quote I came across in working on this was somebody who cast the whole history of slavery in another way. He said that racism wasn't the cause of slavery. It wasn't because Europeans saw Africans as inferior, they made them as slaves. They created the myth of inferiority to justify the taking of people they needed to make these plantations profitable. COHENAnd if you look at the slaves that were brought from Africa to the United -- to America, to the Americas in the triangular trade, over half of them wound up on sugar plantations. And when ultimately there was the sugar -- it was a boom so the more slaves, the more fields planted, the cheaper sugar became. The cheaper sugar became the more people had sugar, the more people wanted sugar, resulting in more slaves. And it became what economists call a virtuous cycle. But you wouldn't call it that if you were on the slavery side of it. And it was a boom that last really into our own time. COHENYeah. I think it's 77. At one point in Britain -- for British people it was up to close to 100 pounds. COHENSo, you know -- and you look at it like in 1800 nothing or 1700 nothing, sugar was so rare it was considered a spice. And then it becomes a staple. And then suddenly things like diabetes, which never existed, suddenly appear. There was one of the early scientists in Europe who sort of linked diabetes to sugar. I came across this study and he said that he noticed it because he noticed that the people that ate a lot of sugar, their urine had the most wonderful pleasing taste. That was a very -- it makes you question about his methods of science. REHMYeah, of course. But when did sugar turn into a stable for the middle class and the poor? COHENIn this era during the slavery boom. In 1811 slave trade was banned in Britain. Okay. So before that in the years leading up to that and after, I'd really say in the 19th century, where if you look at the amount of sugar being refined and produced and then you add to cane sugar beet sugar and the price comes down. And it really becomes a staple for the poor. And like every other food product, in a way, it goes from a luxury to the rich to a staple for the poor. And that -- and it remains that, you know. COHENAnd the great irony of historical irony of all this is the same people whose ancestors were brought here as slaves to work on these plantations in the western hemisphere, they're the ones that get hit the hardest by sugar and what it does. They're still sort of paying the price of it in a way because it's used in great volume in foods you don't think it's used in, even as a preservative. And it's just sort of dumped in. And there's a lot -- you know, the obesity epidemic and a lot of Type II diabetes that we all see in our families, you can really -- you know, Dr. Johnson could explain it -- but it's really linked up probably to sugar. REHMYes. We're trying to get that connection with Dr. Johnson back in a little more clearly. But the question becomes, is sugar actually addictive? REHMThe same centers of the brain. COHENYes. Then I guess you would say that it's addictive. Now, to me, I tend to be a person that sort of thinks that basically being alive something's going to kill you. You're slowly dying just by being around. And using anything is using up, you know. So it's sort of a question of moderation. And it sort of seems like from what I -- from my research it seems that the question is, is sugar toxic, like is it a poison? And it's only toxic if you use a tremendous amount of it, so much that it sort of overwhelms your liver's ability to process fructose. REHMAnd that's the question for Dr. Johnson. How much sugar do our bodies actually need to survive? And how do we know when too much has been taken in? JOHNSONThat is a very difficult question. It's very controversial. I would have to say that what we can see is that there has been a dramatic increase in obesity and diabetes that correlates with increasing intakes of fructose, both from sugar and high fructose corn syrup. And this has been increasing dramatically since probably going all the way back to 1900, you can start showing an increase. JOHNSONAnd so it's clear that the average person is eating too much sugar. And I think that we should be reducing our sugar and our high fructose corn syrup intake. And probably some people are eating way too much. We know that some children are eating 25, 30 percent of their diets as sugar, and so -- or high fructose corn syrup. And I think we need to reduce that. REHMOkay. Now we need to separate out some of these terms. First of all, fructose, glucose, sucrose, do our bodies process them in different ways, Dr. Johnson? JOHNSONAbsolutely. So just for definition, sugar or sucrose is basically a glucose and fructose molecule bound together. High fructose corn syrup contains fructose and glucose freely. And in soft drinks they contain about 10 percent more fructose than regular sugar has. Then there's fructose itself which is a component of these added sweeteners and it's also in fruit. And then there's glucose, which is the primary sugar nutrient -- or glucose is the nutrient in the blood that we use to help power our energy. JOHNSONSo what's unique about fructose is that fructose is basically metabolized different from glucose. And when fructose gets metabolized, as we mentioned earlier, that can cause this depletion of energy before it actually generates energy. And this depletion of energy leads to a response by the cell to hold onto fat or to make fat. And so this is like the professional nutrient to make fat. So it's very different from glucose in the sense that if you pair -- there's two ways the fructose works. JOHNSONSo normally we think of food as being the source of calories and we count calories and that's how you consider yourself whether or not you're going to gain weight and so forth and how much energy you're taking in. But fructose does something slightly different. The first thing it does is it -- when it's metabolized, this energy depletion actually triggers the body to feel hungry. And so there's -- it stimulates -- or it blocks the ability to control your appetite. And it also -- fructose seems to block the ability to burn energy from fat very effectively. JOHNSONAnd so what it does is it ends up stimulating food intake and it blocks energy output and preferentially transfers it into fat. REHMOkay. I want to get to a question that many people have and that is about the fructose in fresh fruit. I have a bowl of mixed fresh fruit each morning containing cantaloupe, honey dew, watermelon and pineapple. REHMIsn't that interesting? What do you have as a daily diet, Rich? REHMWhat do you have for a normal breakfast? COHENI have three little kids so I'm mostly in a daze. I just shove in my mouth whatever comes by. I'm like one of the biggest offenders of all time here. REHMAnd you're talking about sugary cereals, I'll bet. COHENThe people who tend to talk about the problem are the ones that have it. You should know that. Like if you have some how-to author on, if they're writing about how to not be anxious, they're going to be the most anxious people you've ever met. REHMSo you cannot tell me what you had for breakfast. COHENWell, I mean, like this morning I had, like, a bagel and cream cheese, you know. But I'm not at home so it'd be, like, slightly different. I mean, the problem is, all these things, which is I would, like, have yogurt and granola for breakfast. But then you'd have to check to see if it's fruit yogurt, how much sugar it has added into it. It becomes like a lot of work. If I have egg white omelets and -- and I should really talk to Dr. Johnson before I'm eating. COHENI mean, one thing that I found amazing is if you have, like, a glass of orange juice, which we think of as the most healthy thing in the world, and it takes six oranges to create this one class of juice. But if you have somebody eat six oranges, they're going to throw up basically, but they'll drink a glass of juice in a second. REHMAnd you're listening to "The Diane Rehm Show." As you can imagine, we've got lots of callers waiting. I'm going to open the phones. Matt in Cleveland, Ohio, you're up. MATTI'm a long-time listener and let me just say it's such an honor and a pleasure to speak with you. REHMWell, thank you. It's good to have you with us. Go right ahead, sir. MATTWell, thank you. So my -- I've got a question and the lead-in to it is, for the past year-and-a-half, well, I've been exhibiting previously the symptoms of metabolic syndrome and insulin resistant and my weight has been creeping up all the way to 234. And over the past year-and-a-half, I've been able to completely eliminate all sugar and everything that the body metabolizes into glucose, that is carbohydrates. I've physically wiped that out of my diet. And without changing my exercise routine at all, I've been able to lose 46 pounds. MATTAnd I'm not quite out of the overweight category yet, but I'm almost there, so I'm working on it. REHMAlmost there. How tall -- Matt, how tall are you? MATTSo 234 was a lot on me. MATTSo my question has to do with, are other carbohydrates like potatoes and bread and pasta, is that really metabolized in a significantly different way from sugar, or when it hits our bloodstream is it -- I mean, other than the fructose you were speaking about early, is it all really just glucose? And, you know, is sugar a component of the potentially larger problem of carbohydrates? JOHNSONThis is right up my alley. Thank you for asking that great question. We -- you know, there are these -- this thought that not -- there's a lot of carbohydrates that have, like, starch, like rice and potatoes and chips that don't have a lot of sugar in it, but have a lot of glucose in it. And there's a lot of people that believe that that can also cause obesity. And there's a lot of people who believe that you can't just restrict sugar. You need to restrict carbs generally. JOHNSONWe've been studying this and interestingly when we -- and we have a paper that is in press, but what we can show is that when you give glucose to an animal, if you give a lot of glucose water, they can start getting fat just from the glucose. And they can get fatty liver and they can get insulin resistance and they can get all those things you talk about. But what we discovered was that they are converting the glucose to fructose in their body, actually in their liver. And when we block the metabolism of the fructose, we block the fatty liver, we block the insulin resistance. And actually we block weight gain and fat gain. JOHNSONThey still gain some fat, they still gain some weight, but not as much. And they have no fatty liver, no insulin resistance. So we now know that fructose is at the heart of it, even in the -- when you're eating carbs that don't contain fructose. So it's not just the sugar and the high fructose corn syrup. We are actually making fructose from rice and potatoes. Now interestingly, not everybody's doing that and we're trying to figure out, you know, who's more sensitive to -- how can we predict who's going to -- starch to sugar in their body -- or to fructose in their body and who's not? JOHNSONAnd so this is a pretty exciting discovery. It's -- we have -- it is in press, but it's not published yet. REHMIt's interesting, Rich Cohen, I would think, having written this article and now hearing what's happening. And you yourself saying people are really consuming more sugar than we ever thought. Something is going on. Either our bodies are changing or the amount of sugar we're craving, something's happening. COHENWell, I think, you know, it's been happening for probably the -- well, it's been happening since like the -- continuum since like the 1700s or the 1800s. But in the last several years, I mean, people have really been avoiding fat. And what if fat wasn't really the thing to avoid, you've run away from the thing right into the thing, if you know what I mean. REHMRich Cohen. He's the author of "Sugar Love" in the August issue of National Geographic. REHMAnd we have so many questions here from our listeners. I wish we had another three hours to answer them all, but, of course, we can only take a few. Let's go to Hagerstown, Md. Hi, Jim, you're on the air. JIMHi, Diane. Thanks for having me. JIMI'm a listener and supporter of WAMU. JIMThank you. I love this show. Sugar has been a big part of my life, as I'm sure many Americans. Two-point question, I started juicing vegetables and fruits about 45 days ago. And the change in my life has been incredible. REHMNow, you're saying you're just juicing veggies? You're not juicing fruits? REHMOkay. So what's your question? JIMWell, it's amazing the change without that processed sugar. REHMOkay. Dr. Johnson, what do you think of that? It's a combination of veggies and fruits. JOHNSONWell, there's no question the veggies are doing you wonderful good. There's also no question that the fruits have a lot of good things in them. So it really comes down to how much fruit you're eating. And the other question is how much processed sugar and high-fructose corn syrup are you actually cutting out? So if you're actually cutting out soft drinks and so forth, you're going to see a great benefit. Now, I will tell you that if you're drinking a very sweetened fruit juice -- this doesn't sound like you're doing that -- but, you know, try to keep back on the number of fruit in the juice. JOHNSONYou don't want to have more than like three or four -- well, maybe more than four fruit in any particular juice. And I would probably recommend only putting in like two fruits or less per juice. But it sounds like it's only part of the drink is the fruit, so that's good. I have had people who've had pure fruit juice and, you know, if some of those people have actually had trouble losing weight until they cut the fruit juice back. But I do know the pediatric society believes that fruit juice is associated with obesity in children, and they've issued a recommendation to reduce the amount of fruit juice in children for all those reasons that I've been talking about. JOHNSONBut there's no doubt that fruits contain a lot of wonderful things, too. JOHNSONAnd if you're able to reduce the amount of sugar that you're eating and high-fructose corn syrup you're eating from other foods, this is definitely going to be an advantage, I think. REHMRich, you wanted to add something? COHENNo. It's just amazing. I mean I've stopped giving fruit juice to my kids. All the stuff that my mother, who I'm going to talk to as soon as I get off the air here told me was good, is actually, you know, not so good. COHENBut the important thing for me is as just a human out there is you want to still have food that you enjoy and that's good and that's satisfying because eating a good meal now and then is part of the reason it's good to be alive, you know. So if you go too far you end up whipping back the other way, if you know what I mean. REHMHere's an email from a D.C. pediatric endocrinologist, specializing in the care of children with type II diabetes, Dr. Johnson. She says, "What are your opinions about systemic, long-term ways we can address our added sugar obsession without putting so much responsibility on the individual consumers and patients who may not have the know-how or funds to find healthier alternatives?" JOHNSONWell, thank you. I think that the most important thing we can do is first, obviously, education. But the other thing is I do think that the major culprits are soft drinks. I think that, you know, our work shows that it's the concentration of fructose that the tissues see in the body that cause this reaction, more than actually the amount. I'm not against eating sugar. I will have a chocolate cake every now and then myself. And I think that we shouldn't -- as Rich is saying, we shouldn't tell people never to eat sugar or that sugar's toxic in that sense. No way. JOHNSONWe should be able to eat our sugar, but we need to watch those foods that are -- we need to moderate how much we eat. We need to reduce the amount. And the biggest target is soft drinks, and I’m actually in favor of sugar tax on soft drinks. REHMAll right. Let's go to Norman, Oklahoma. Hi there, Steven. You're on the air. STEVENOh, good morning, Diane Rehm. STEVENThank you for taking my call. STEVENI had a question about artificial sweeteners, something like sucralose. Does it spike your blood sugar? REHMWhat about that, Rich? What did you find out about artificial sweeteners? COHENWell, I didn't really write about -- I mean artificial sweeteners gets me into the history of my family. And probably -- I didn't know Dr. Johnson when I was researching that book, but it's interesting in that, you know, saccharin, which is just this very early, cheap artificial sweetener discovered by accident, like most great things discovered by accident. And now the artificial sweeteners have become so much more powerful. I mean a thousand times more powerful than sugar, as far as a sweetener. And I don't really know what exactly they do in the blood. REHMI can't stand to even to taste them, Dr. Johnson. JOHNSONI can make a comment here. So a lot of the artificial sugars are because they're sweet they work on the taste receptor, the sweet receptor in the tongue and they actually do give a small dopamine pleasure response in the brain. So there's been some thought that artificial sugars may actually stimulate food intake, as well. But it's a much, much smaller spike of dopamine in the brain than you get with, for example, you know, a chocolate candy bar. REHMBut are they good for the rest of the body? JOHNSONThat's right. So it's a very small signal. And I will tell you that if you have your choice between a soft drink and a diet soft drink, I would pick the diet soft drink any day because we know that you get this big response in the brain, we get this big effect in the liver with regular fructose. One interesting thing is in an animal, if you knock out the taste receptor, they don't care for artificial sugar any more, but they still love regular sucrose, and they still get the dopamine response, even if they can't taste it. REHMBut, Dr. Johnson, let me ask you further about these artificial sweeteners because haven't there been some questions about the negative effects on the entire body of those artificial sweeteners? JOHNSONOh, absolutely. So there are a lot of other issues raised with artificial sweeteners and relationships with like bladder cancer and cognitive problems with aspartame. And so there are a lot of other issues. It's probably better to drink water and or milk -- at least low-fat milk and, you know, tea and coffee both seem healthy, too. REHMAll right. To Traverse City, Mich. Hi there, Tara. You're on the air. TARAWell, thank you. Although I should have hung up the phone because my question was also about artificial sweeteners. I'm a type I diabetic and so for my whole life been encouraged to use artificial sweeteners for a sugar substitute. However, I'll move on and ask a second question, just about what, as we're listening to some of the problems with both artificial and traditional sugar sweeteners, what is it that each of your guests would advise just the average family to do to try to mitigate some of their sugar intake? What are some practical steps that they can take to avoid the kind of sugar intake that we're talking about as harmful? COHENI think, you know, just as a parent you just try not to have it around the house. And then the best defense against everything, without knowing all the science behind it, is just to eat less, sort of. You know what I mean? You eat less and you eat better, then you don't get so hungry in between meals. And the problem is that things are done, you know -- And really for another problem for a parent is -- and talk about beyond the individual being responsible. A lot of times you feel like you're being tricked when you go to buy food. COHENIt says something that's the opposite of the truth. It's almost Orwellian. You know, products that are very unhealthy are packaged and sold to you as being healthy. And I agree with Dr. Johnson, that the main thing is education, but also, as a parent, we could use a little bit of help. REHMWhat do you think, Dr. Johnson? JOHNSONI love Rich's comments. I mean what we try to do -- I've two little kids, too. And I try to educate them. We completely tell them that soft drinks are off the table, you know, they're not allowed to drink soft drinks. We do allow them to, you know, have birthday cake and things like that, but we try to be in moderation. JOHNSON…that balance is always good. REHMOkay. And Karen, in St. Louis, Mo. has a question. "Rich, please talk about the difference between sugar cane and sugar beets and how they are refined into the sugar we buy at the grocery store." COHENWell, I think for the purposes of what you ingest there's no difference. Dr. Johnson can correct me if I'm wrong. There's no difference, just a question of -- you know, it's interesting if you look at it historically. A lot of the pharmaceutical companies came from Germany, life Pfizer and we know a lot of the pharmaceutical companies are Germany. And one of the reasons is the Caribbean Islands were really colonized by the British, and by the Spanish. And the Germans were kept out of it, and they had no source of their own sugar. And for a long time it was like sort of the Holy Grail. Could you process another vegetable or fruit to create this kind of processed sugar that you could put into the food supply? COHENAnd ultimately an answer was found in beet sugar. And now it's beyond beet sugar. So it's sort of like finding another -- I mean, I don't want to like -- I can't really oversell how important sugar is in the whole history of the Western world. It is like oil. And the search for sources of sugar, as it became so important in the diet -- and the easiest kind that's like the equivalent of the oil right on the surface was sugar cane. And beet sugar came a little bit later, but still gives you sugar. REHMWhat about the environmental impact of large-scale sugar refineries, Rich? COHENWell, I mean, environmental impact, look at the islands like Jamaica and Barbados, which had thriving eco-systems with a lot of different crops and a lot different things growing, and they became single-crop islands and the water table was sapped and they had a lot of ecological damage. So, you know, like anything, it's like the planet's equivalent to your eating only birthday cake, sort of growing only sugar or growing only one product is going to be very bad for wherever that takes place. REHMAnd you're listening to "The Diane Rehm Show." I think we have a little clarification to do here, Dr. Johnson. Here's an email from Sam. He says, "We're told we should eat fruits, veggies, nuts, dried fruits for a healthy living. Many of these food items have fructose. One of your guests said that fructose is bad for health. Does he specifically mean fructose corn syrup or sugars in fruits and dried fruits? Also, what is the role of sugars on the bacteria living in the human bionome?" There you go. JOHNSONSo there's several questions there. JOHNSONI will tell you, some animals can get very, very fat from fruit, but they wait until the fruit really ripens and it's soggy ripening. And at that point it's very sweet and the nutrients go away. But the kinds of fruits that we -- or the good nutrients disappear. The kind of fruits that we like tend to have high content of vitamin C and all these other things. Having said that, for our person who emailed, I would say that dried fruits in general are more fructose than they are good. And so I would not eat a lot of dried fruits, but whole natural fruits are really quite healthy. REHMAnd one last question, is there a relationship between sugar and alcohol? COHENWell, yeah, because rum is one of the byproducts of the process by which sugar cane is turned into white sugar. Rum is distilled from the molasses. So rum is basically sugar water, in a way, fermented sugar water. And one of the really weird things in history was there was a huge amount of this molasses stored in Boston at one point in the 1800s in huge warehouses, and they ruptured and you had a syrup flood in downtown Boston. Very dangerous, but easy to run away from, if you think about it. REHMWhat about that, Dr. Johnson? Is a person who is likely to be addicted to sugar, perhaps at the same time or separately addicted to alcohol? JOHNSONI think it's a good hypothesis. I don't know any proof of it, but certainly both of them can cause a lot of, you know, if you eat a lot of sugar or high-fructose corn syrup you can get fatty liver and alcohol can cause fatty liver. They both have some addicting components. And so, you know, there are people like Dr. Ludwig, who link the two together, but I think we need more data on how well these two different nutrients or two different food groups are related. REHMOkay. And that was Dr. Richard Johnson. He's professor of medicine at the University of Colorado, Denver. He's the author of "Fat Switch" and "Sugar Fix". He was one of the first to have NIH-funded grants on fructose. Rich Cohen is the author of "Sugar Love: A Not So Sweet Story." It appears in the August edition of National Geographic Magazine on newsstands July 30. You really ought to read it. Thank you both so much. Good to be with you. And thanks for listening. I'm Diane Rehm.